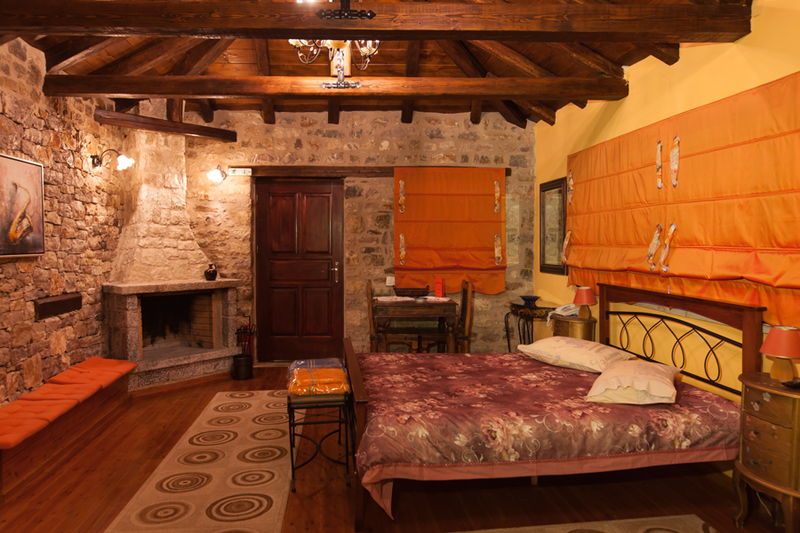 The guesthouse "The Tholos" has become the ideal, four seasons, choice of alternative tourism. This is a small complex situated in the village of Valtesiniko at an altitude 1236m. 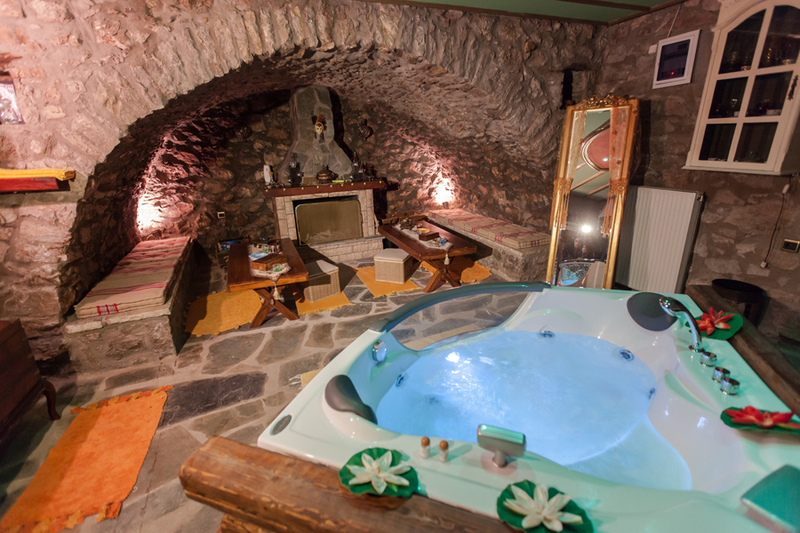 It consists of a two-store stone house with its main feature the stone dome constructed at 1860, an old cellar, which today houses the wellness area. The complex consists of eight (8) rooms. The rooms are constructed in an Amphitheater style and offer a panoramic view at the highest point of the village. 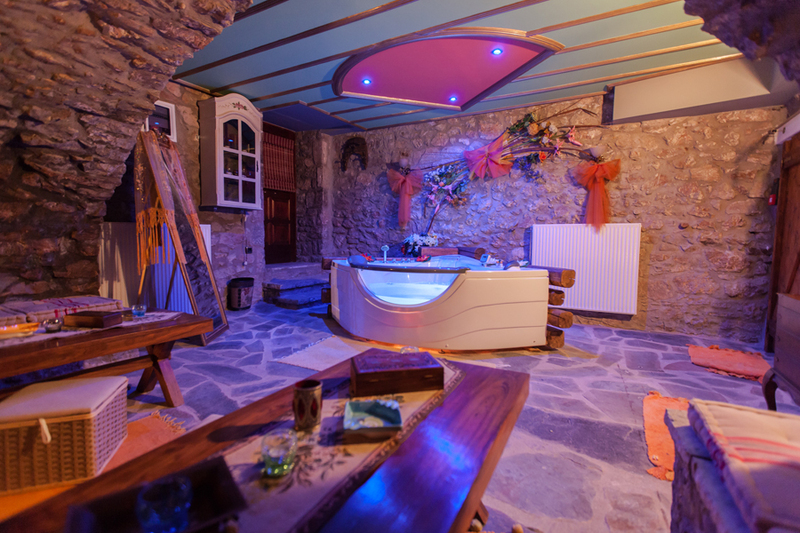 Built with Eco-conscious, utilizing local natural materials such as carved stone and wood and decorated respecting the tradition it offers, at he same time, modern amenities. 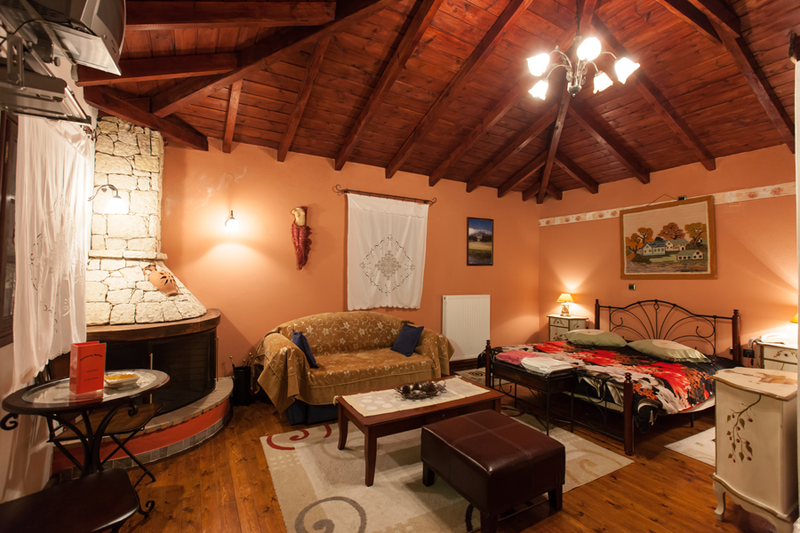 The Tholos is one of the few accommodations with traditional identity that truly accommodates your expectations of warm hospitality while being a base for short excursions to the Mainalo Ski center. Valtesiniko is a small village located at an altitude of 1236m, is 240km far from Athens, just three hours drive. Valtesiniko is the most mountainous and most picturesque village with a population of about 250 residents, adequate number when you consider the devastation most rural villages have suffered. Picturesque houses of stone and wood impress with their architecture and their harmonious integration into the natural landscape. The style and philosophy of the famous craftsmen from Lagadia village has defined the architectural character of the village. Today the inhabitants engaged in farming, agriculture, beekeeping and tourism. In Valtesiniko village is produced the high quality honey of the variety ‘Vanilla Mainalo “, the only honey with “protected origin” designation of in Greece. This delicious honey with white iridescence begins to Harvest in mid-June. Since June 2006 is operating the Valtesiniko Folklore museum with many exhibits. The museum is housed in the stone building of the Cultural Centre of Valtesiniko, bequest of Sofianopoulou brothers who left their entire estate to the village. Ancestral heritage boon, consider the villagers, Historic Monastery of the Assumption of the Virgin Mary and the dependency of the Monastery of St. Nicholas. In the village there are many churches the most important of which is the Saint Theodore and Saint George. In this local festival takes place throughout the village and many visitors that come about it. Becomes lively revival of the old way of threshing with horses, in a paved threshing floor situated close to the Monastery of the Assumption of Virgin Mary, alongside musical performances, dancing and feasting. Children and whoever else wants, can participate in threshing, lifting the threshing cobs with fork while the horses make their circle around the threshing floor. Especially for the children of the city, this activity is a source of great joy and enthusiasm, as it gives them the opportunity to actively participate in an authentic traditional activity in close contact with the horses, images and smells of nature. The revival of traditional threshing remind older images from the recent past, before the animals are replaced by the harvesters. Although the effort fell through the use of machines, they still miss the atmosphere of euphoria and joy that prevailed since even pillaged with horses. The young people learn something about their place, the oldest rural life, the tradition, the heady tying land animals and man. During the winter, the snow covers the roofs and dresses everything in white. The chimneys smoke and friends are chatting lively in cafes and taverns. Fireplaces burn almost around the clock. Spring is here in April. Lovers of wildflowers, in April and May, going in the surrounding hills will discover many beautiful surprises. The nature wakes up slowly and beauty is intoxicating. May and June, life thrives. Shrubs and trees flying stems, branches, leaves and flowers. Bees and other flying insects buzzing, small mammals, reptiles, amphibians, make their appearance in front of the careful observation of nature. In June the number and variety of butterflies are impressive. In cliffs, opposite St. Nicholas monastery, the birdwatchers will enjoy Vrachokerkineza to commute to their nests. In the village or a few steps away can meet with a red-backed shrike, a Magpie, a Kalogeros or Galazopapaditsa a Goldfinch, plenty of swallows. At night you hear the owl or Gkioni, or even the rarest crows. Go with your children to the creek “Pori” just outside Valtesiniko on the way to Migdalia village, to gaze at the crabs, tadpoles and frogs, the limpeloules, the water spiders and water beetles near the watermill Pavlopoulos. Let them play with the water and convey your enthusiasm for their findings. Autumn deciduous trees, such as walnut, gradually shed their leaves, giving the landscape beautiful colorful accents in shades of brown, orange, red and yellow. The sub floor turns again green by the rains which accepts with so much gratitude the thirsty ground after the heat of August. So when the autumn progressed, the sad beauty of naked trees compensates the resplendent green carpet. Of course firs, like scattered junipers never lose their leaves and observe proudly the alternations of seasons, waiting the spring to fly new leaves and branches…. Follow the trails and forest roads, let your eyes rest on the beautiful landscapes created by luxuriant vegetation, canyons and ridges. Paliokastro is the highest peak of Mainalo mountain in the region of Valtesiniko. The peak that towers above the village has a height of 1387 m., While further south the height reaches 1437 m., According to data from the Military Geographic Service. The climb to the top -especially in the spring or early summer- is a unique experience. The route is difficult in the last part, because the trail is off and will need to improvise. The best time is the sunset. The views and colors are unique. To the east of the peak, at the root of rock and among the oaks, still stands a part of the castle and at the southern highest peak, the base of a single tower of Frankish and Venetian era. This track, except from the short climb up to the foothills of Paliokastro, after forming the nerrow road, is now accessible to everyone.It is a path in the woods, with benchmarks shrine of St. Panteleimon -where built a beautiful church- and the shrine of the Holy Trinity. Further, in the property of John Panagoulias, is the eponymous source. For those who know the place, going west, the road guidance to Zareli and from there descends Stis Grias Lithari or Kryavrysi.The dense fir forest is impressive and deep-shaded slopes offer in summer incredible coolness. An old and a favorite place of recreation for the locals was the source and the rock in the ‘Grias to Lithari “. Today, because rarely pass people from there, one needs to know the place, or have a guide. It is a relatively easy path through the forest. From the foot of Paliokastro, follow the path west. In our one hour hike, we find springs, streams of Ginis and Geroutsos, Geroutso’s cave, and a piece of forest thin towering firs.Climbing on the rock is easy and the source with the cold clear water will refresh us. This source is worth of a little care now, that the shepherds do not graze their animals around. The greens are growing quickly and hide it. The stream that starts from this source joins, downhill, the water of Kryavrysi and continues for the mills of Kokkinis and Pavlopoulos. Around the Kryavrysi previously was a small settlement. There you can reach in three ways: at the beginning of Paliokastro you turn west after Miliari, the trail ascends right. It was the old road to Langadia, now almost forgotten. The other road followed the stream of Pavlos and the watermill of Kokkinis, and the third is the one that exists today, the road leading to the plains. This rich source offered the water of the orchards in the area, three mills and later in the plain. Following the road to Agia Paraskevi of Lagadia, on our left, is the “Kaimeno Xhorafi”, the “Fylachtra of Panagis” and the “Zareli “, sites rich in fragrant oregano. Beyond the Krania, all famous haunts of Panagoulaion. In the area of Zorianou there are the remains of the settlement houses that once existed. The scenery is breathtaking with the typical rock and its source. The water that formerly gave life to gardens around there, now enhances the water supply of our village. From there uphill we reach the shrine of Saint-Thanasis. Moving east we find Alogovrysi. The view from there is a pleasant surprise. We have at our feet the southwest region of Magouliana Village, the sanatorium, the limits of Vitina town, the plain. On the eastern side of Alogovouni lies the Kokkinovrachos. There, perched scared the inhabitants of Magouliana village chased by Ibrahim on summer of 1825. The recesses of the rock fortified still stands to remind us of those difficult years. This route has recently signaled by the Municipality. On the way to Olomades small village, the plate directs us to gorge Rentezela. Of course this is not the place name of the region of Valtesiniko but Kerpini and Drakovouni. The trail follows the eastern part of the canyon and offers an unusual view of the village, the gorge and the monastery of Saint Nikolas. The field of C. Papageorgiou in Barmpesiniko hides many graves with stone slabs, but no one has investigate the place systematically. For the period to which they belong, only assumptions can do. Ending our journey are Olomades small village with the nice church of the Holy Apostles and very hospitable people. The most demanding can continue to Kourouveli, and meet the chapel of Prophet Elias and Agia Zoni. A small, easy and beautiful route is the one that leads us to the bridge in “Pori” on Pavlopoulos watermill. The mill was donated by the last descendants of the family in St. George. From the stone bridge will go left on non asphalt road beside the stream. Soon we will ever see the mill on the left our half-hidden among the walnut trees, willows and firs. I believe that those who lived in the glories of this symbol of our culture our folk lament that see him standing empty-handed, the mercy of the weather. The stream, crabs and frogs will attract the interest of smaller visitors. Continue uphill beside the stream. We have come down considerably from the altitude of the village ahead Paliokastro seems huge. Soon we will meet on the right ruins, the watermill of Kokkinis. The more demanding if they continue to go uphill will see the stream split smaller on the left that leads Stis Grias to Lithari, larger on the right that will lead us to the source, the Kryavrysi. Saint Vlassis and the region “Vorila” is a small settlement west of our village. We leave behind us the “Pori”, the beautiful chapel of Agia-Marina, ascend to the Virgin with the same name, the source in the property of Petropoulos and the source at “Kalanos”. We arrive in Reppeika joints of “Vorila” from the non asphalt road that goes side by side on the mountain. There is an award-winning marble, untapped yet. The landscape here is different. If appropriate season, oregano would smells delicious. The small spring quenching and our Saint Vlassis expects us to pray. Lake Ladon looks ahead. But to enjoy the wonderful view must descend the trail west or go north on the non asphalt road and stop to climb the hill to the west. The view of the lake and surrounding panoramic area, certainly will compensate us. This is a special, spectacular trail full of memories. Descend the non asphalt road after the crossroad for Saint Nicholas, to “Mouries”. At the end of the slope we find the stone bridge and left before the move will see the mill “ZIOZIA” ruins now from the time. This mill had two stories but the most impressive feature was the long groove that Ziozios (Panagiotakopoulos) had literally carved into the rock. We follow the stream east and soon we arrive at Chionovrysi. This is where the stream meets with that of St. Nicholas. North stands the mountain Routo with the rocks of “Linaristra”. Their forts, inconspicuous amid the oaks of inaccessible rock. In the south, the fortresses of Balogiannis stand derelict in belts of rock. Descend northeast ravine. Our awe overpowers at “Dungeon” (Boudroumi)- name and thing. These caves and these rocks once housed the horror and agony of our ancestors. They stood allies and saved them. At the height of Olomades is the “Skordouli”, the most important stronghold of the ravine after St. Nicholas. Fortified caves on three levels, with timbering and turrets are now left to their fate. With difficulty one can climb, from the left side of the rock and moving southeast to reach the Olomades. On the road leading to the village and two kilometers before we reach, there is a non asphalt road on the right, leading to Ela. There is a small valley between the trees. Small gush in several respects, important ones are the properties of Papageorgiou and Zacharopoulou. Now vigetable fields are scarce but many walnut. Before getting to come to Ela a new non asphalt road to the left leads to the ruined mill of “Koulis” and the road to the bridge that formerly connected the village with Olomades. Following this road to Olomades on our right is the Sotira- old settlement- with family pens of Terzis. Beyond the Floskos with the famous spring that supplies water today the settlement of Olomades. The fountain of Nteligianni is higher, in the property of C. Panagoulias and in reached easily from the road to Lasta village. Valtesiniko, Magouliana, Vytina Vlaherna, Levidi, Kardaras, Mainalo Ski center, Vitina, Valtesiniko. A great day trip that will give you the opportunity to visit the surrounding villages and the Mainalon ski resort for your skiing. Valtesiniko, Pirgaki, Elati, Libovisi, Arkoudorema, Piana, Limeria Kolokotronis, Chrysovitsi, Valtesiniko. A great day trip for all seasons literally through the firs to enjoy the beauty of the landscape, birds chirping and to pay tribute, to visit the home of the liberator of the genus Theodoros Kolokotronis. Valtesiniko, Stemnitsa Zygovisti, Dimitsana, Lucios river Gorge, Zatouna, Valtesiniko. Great day trip for all ages that will show you another side of the area and for those who love rafting will be a great opportunity to visit the gorge of Lucios river. Small village built in a local traditional style. It is the highest village in the Peloponnese and the winter has very few inhabitants. It has a cafe and a tavern. It has three churches, one of which, the Assumption of Virgin Mary, who has a remarkable wooden temple that is worth to see it. Traditional tourist destination especially in summer. It is built on a small plateau and features folk museum and several churches, the most important of which is St. Tryphon in the central square. It has many taverns and restaurants, pastry shops, traditional products shops and woodcuts souvenirs. Relatively small village situated at the foot of Mainalo mountain with restaurants and other small shops. Village at the foot of Mainalo mountain with fairly good infrastructure. It has several restaurants and taverns and various shops. In the morning or afternoon you can enjoy your coffee in the main square. 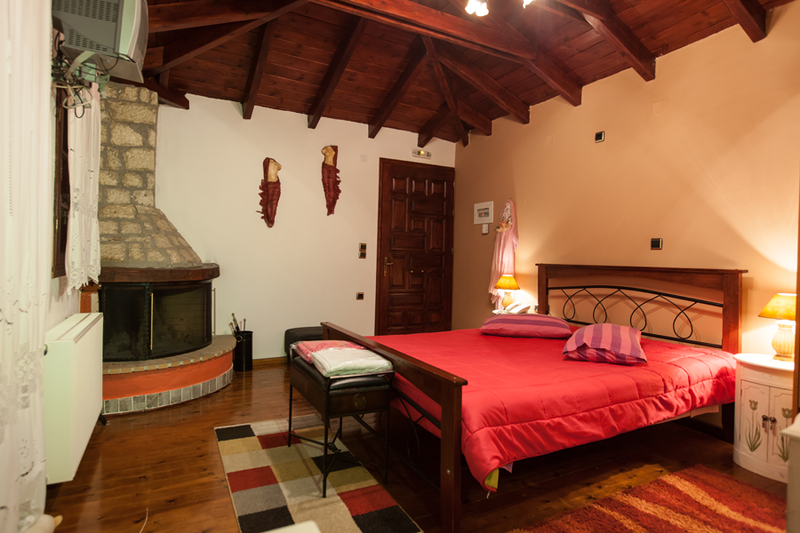 Known ski center with slopes for all possibilities and great dining facilities. 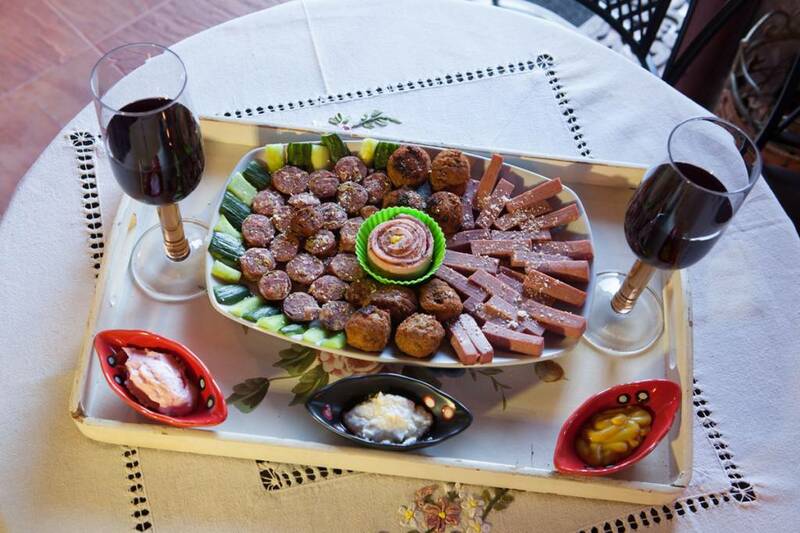 Even near the ski resort there are other restaurants with traditional food. Residues of small village has been relocated to Vitina due to the risk of landslides. Small village literally in the firs. The winter has few inhabitants. On our way from the village we find a traditional fountain with very digestive water. The village where Kolokotronis (the leader of the Greek revolution of 1821) was born is now a pile of rubble. In recent years the house has been repaired and has been adapted into a museum. There we find enough information about the life of Kolokotronis and revolution. The surrounding area which was the village square has been given to the disposal of visitors and together with cold running water all the time is a good choice for picnics. It is a picturesque village, nestled in the pine forest of Mainalon and built on the eastern and western apron of large rock on which is founded the Saint George church. A church that dominates throughout the region and as a lighthouse, illuminates and protects villages of Falanthos area built in the early twentieth century. Chrysovitsi is mountainous village of Arcadia. It is built at an altitude of 1,100 meters in a firs slope of Mainalo and is one of the most mountainous villages of the Peloponnese. It has been declared a traditional settlement. Dimitsana is a historic village in the Peloponnese, the capital of Gortynia province and seat of the municipality of Gortynia. 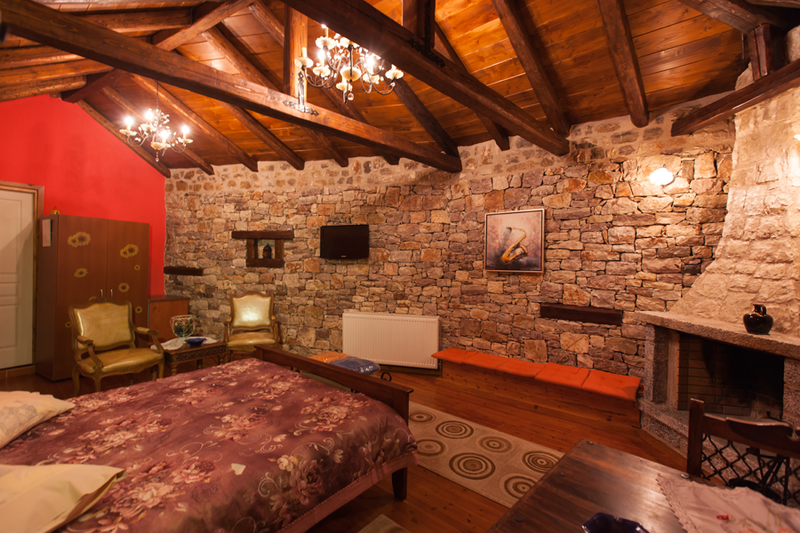 Dimitsana is built on a hill at an altitude of 950 meters, from the southern side of which provides wonderful views of the plain of Megalopolis and Taygetos mountain. Dimitsana during the Turkish occupation played an important role with the “secret school” and in 1821 with “Dimitsana gunpowder” produced there. It is home of martyr Patriarch Gregory V, whose statue dominates the central square, which was donated by Maraslis, and Metropolitan Patron Germanos, where both houses are preserved. The museum of Dimitsana housed in the Library, exposed weaving, looms, folk art and archaeological collection. Just outside Dimitsana lies the Open Air Water Power Museum, which aims to highlight the traditional water power plant was formerly widely distributed in the region. 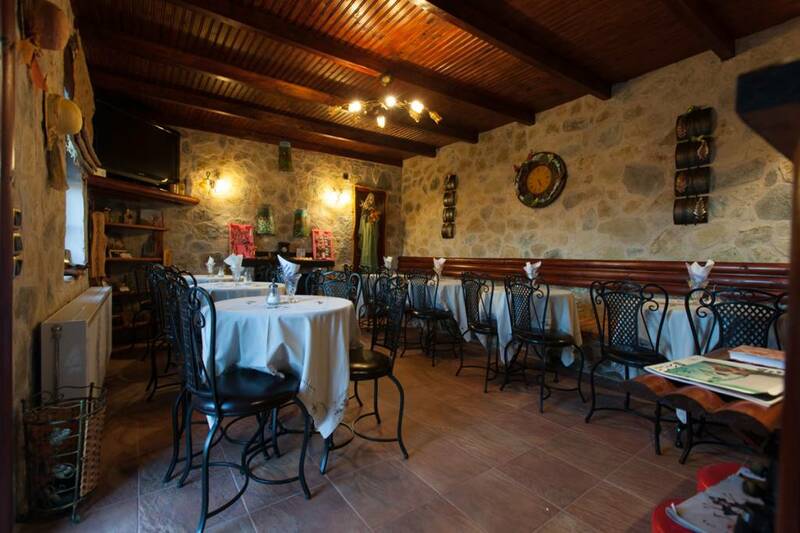 Dimitsana has several restaurants and taverns with local food, lab of traditional sweets and several other shops. It is built at an altitude of 1,160 meters on the slopes of Mainalo and is one of the most mountainous villages of the Peloponnese. It has been declared a traditional settlement. In the village square is the church of the Savior, while notable buildings are the old elementary school, Kapodistrian school building, which operated until 1957 and was declared a protected monument. Built in Mainalo at a height of 1080 meters is classified as a traditional settlement. The area is known since antiquity as Ypsoys. According to legend, the ancient Ypsous built by Ypsous, one of the fifty sons of King Lycaon of Arcadia. Flourished during the Byzantine period, when it was known for the famous bells. It was the seat of Theodoros Kolokotronis who called milkmaid of Moria. He was the seat of the first Peloponnesian Senate and first informal capital of the rebellious Greek nation for one day-May 27, 1821. The monasteries of St. John the Baptist, one of the most important monasteries in the Peloponnese, the Monastery of Philosophou (Virgin Mary) and the Holy Monastery of Zoodochos Pigi (15th century). Τα μοναστήρια του Αγίου Ιωάννου του Προδρόμου, ενός από τα πιο σημαντικά μοναστήρια της Πελοποννήσου,την Ι.Μ. Παναγίας Φιλοσόφου και την Ι.Μ Ζωοδόχου Πηγής(15ος αιώνας). Στη Στεμνίτσα λειτουργεί Επαγγελματική Σχολή (ΕΠΑΣ) Αργυροχρυσοχοΐας. Zatouna is built over the river Lousios. The name is Slavic and means beyond the river. Ancient travelers wrote that the place was very inaccessible because of wild vegetation. 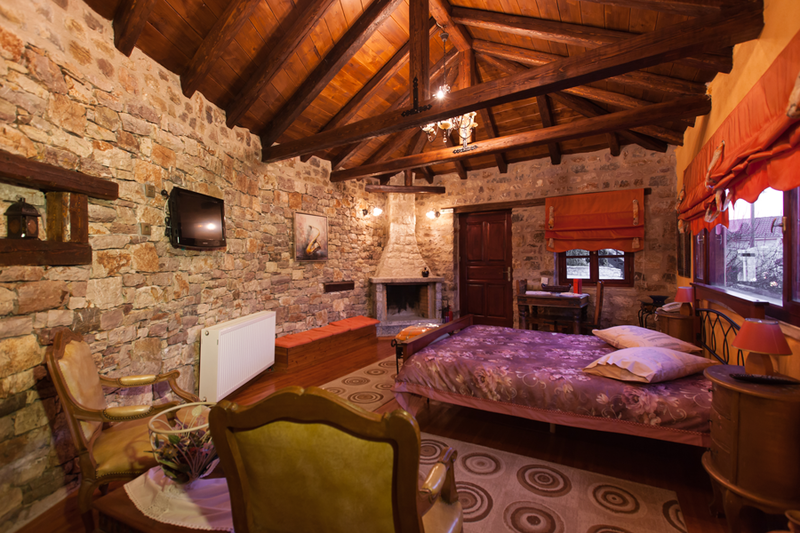 Located four kilometers from Dimitsana. It has been declared a traditional settlement. From Zatouna originate Staikos Staikopoulos, the chieftain who conquered Palamidi (in Nauplion), which had occupied the Turks etc. Lousios is a river in Peloponnese, a tributary of the Alphios, with a length of about 23 km. According to tradition it was named so because its waters bathed the newborn Zeus nymphs Neda Agno and Theisoa. The sources are by the church of Agia Paraskevi, near the village Kaloneri and south in the region of ancient Theisoa. The Lucios, after passing west of Dimitsana, crossing an impressive gorge of 15 km long and with a width of about 2 km before reaching the Alphios, near Karytaina. On both sides of the gorge are two historic monasteries, the Monastery of the Philosopher and the Monastery of Saint John the Baptist. The gorge was declared in 1997, as a single archaeological site and is protected by the Ministry of Culture. From the west side of the canyon passes national path 32 (an offshoot of the European path E4 GR), which starts from Vytina and ends in Gythio. The Lucios offeres opportunities for alternative tourism (hiking, canoeing and rafting).